Do you have a child in college or university? Did you cry the day you dropped him or her off? My son is far from the university years (he’s 6 years old) but I already know I’ll be crying when that day comes. A few of my friends have already sent their kids off to college and yes, there were tears. I imagine it’s a difficult transition where you know they need to spread their wings and gain some more independence while at the same time you want to keep them safe at home. While they are away at college, you can send them a care package to let them know you are thinking of them plus a few comforts from home. 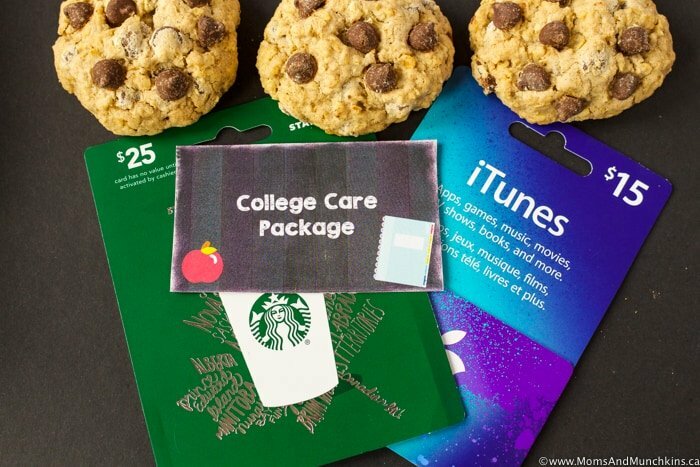 Here I’ll share some college care package ideas that you know they’ll need or appreciate plus some free printables to help you get started. We have the FREE College Care Package printables for you to use. 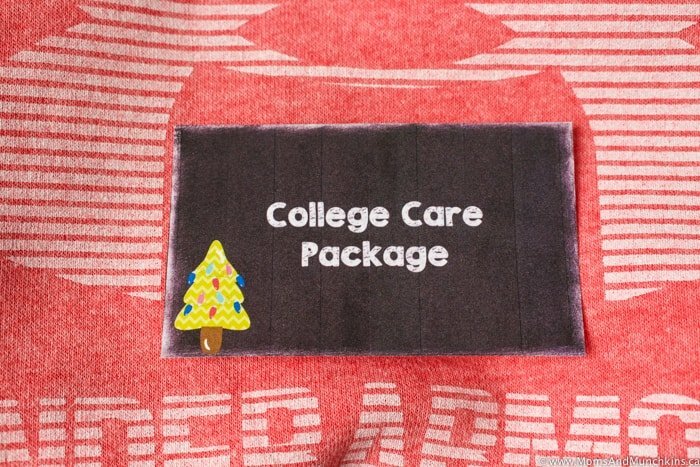 Includes both “College Care Package” and “University Care Package” labels. 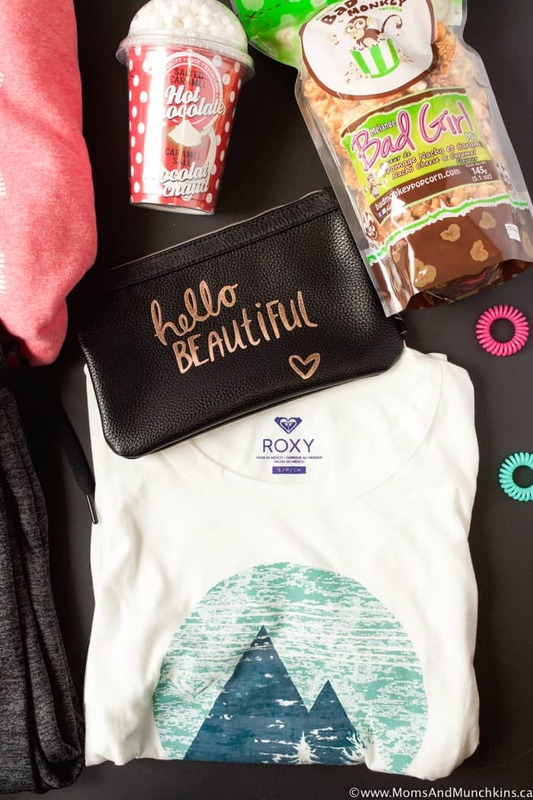 Now let’s jump into the care package ideas for those college or university aged kids! I started with a trip to Sport Chek to pick up some comfortable, casual clothing like a hoodie, jogging pants, and t-shirts. 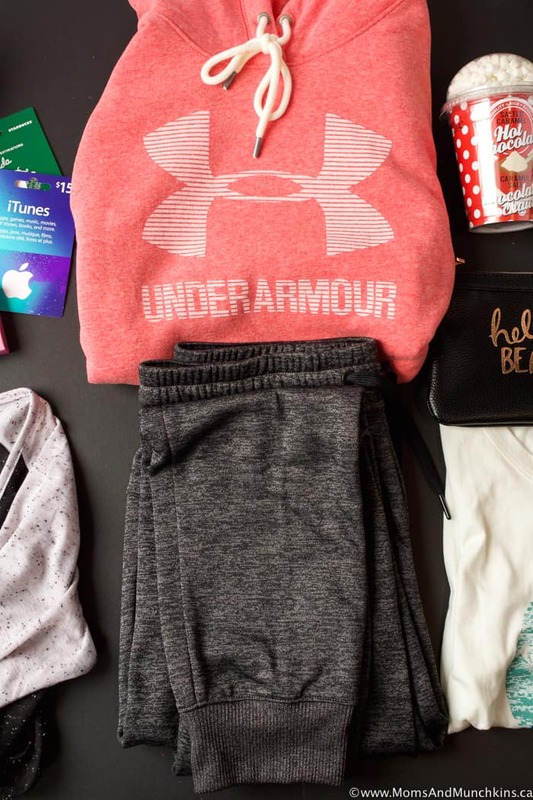 Sport Chek is a great place to shop for that age group because (1) you know Sport Chek carries the brands that age group likes and wears; (2) they have a great selection of clothing, shoes, personal electronics and sporting equipment that teens love. 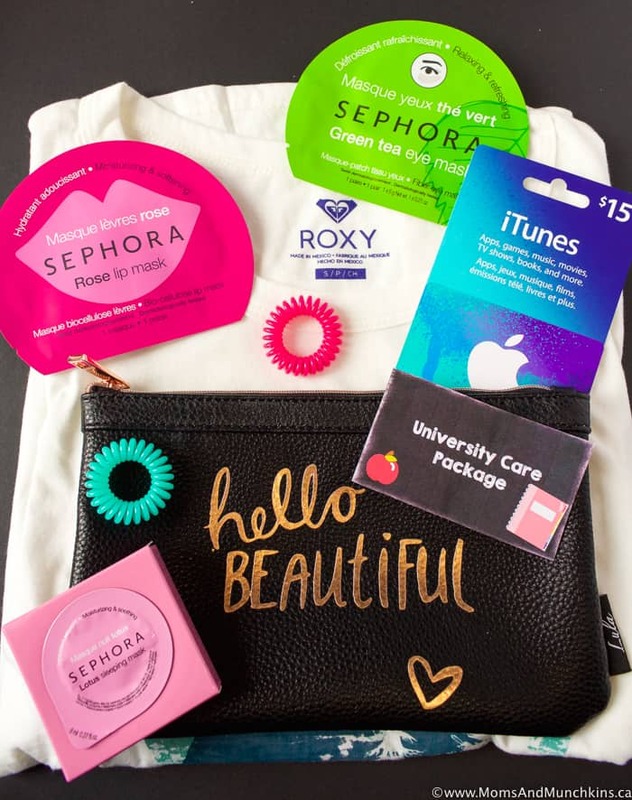 the pricier personal hygiene items like face masks, salon hair care products, makeup, etc. 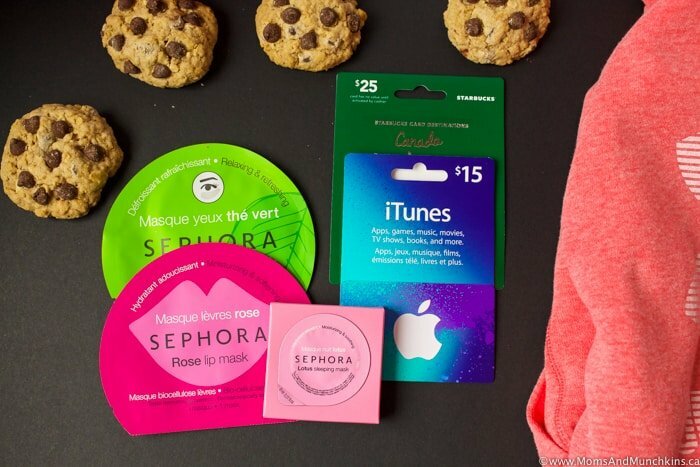 gift cards for things you know they’ll use like iTunes for music or apps, fast food restaurants, gas stations for fuel, grocery gift cards, specialty coffee shops, movie gift certificates, etc. some of their favourite non-perishable food items that they can’t find or afford there like cookies, candy bars, cereals, etc. memberships to things that will help them take care of themselves or relax like gym membership, spa certificate, leisure centre passes, etc. If you can easily package them up, some of Momma’s homemade cookies are always a great idea too. Make sure it’s something that will travel well though. My grandma once sent my dad a package of his favourite jam cookies but by the time they got to him, it looked like a box of bread crumbs. Ha! It may help to freeze the cookies before packaging them up for delivery. 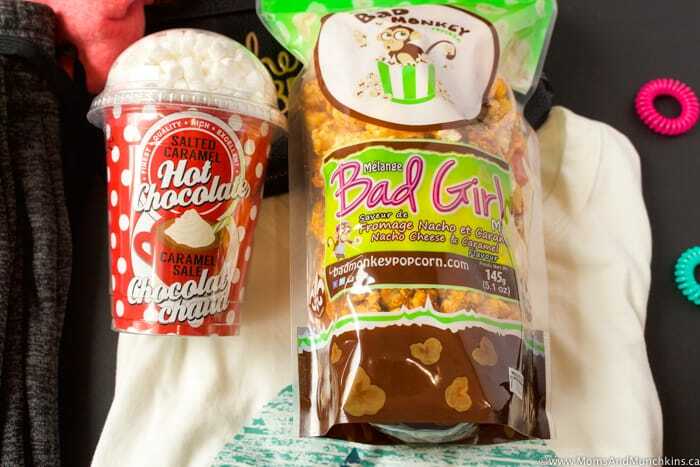 Fun snacks that they can enjoy in their dorm room or apartment are always a great idea too like specialty hot chocolates, flavoured popcorns, movie night snacks, etc. 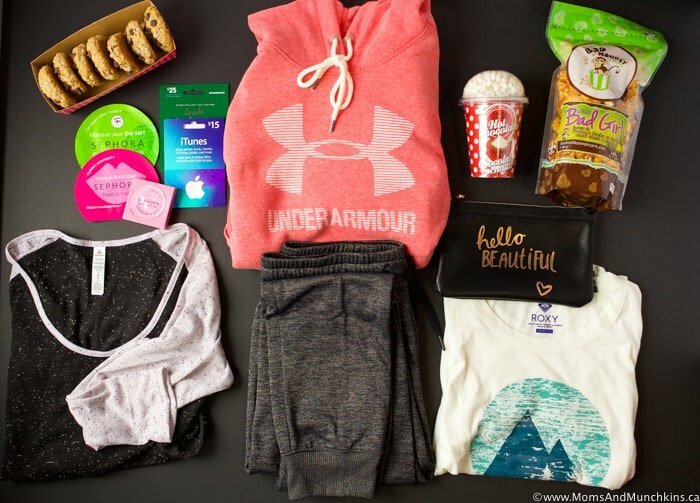 What college care package ideas do you have? Leave us some more ideas in the comments below! Or maybe you are a college student – tell us about some of the items you’d be happy to receive in a care package. For more fun ideas for the holidays like recipes, free printable games, gift ideas and more, visit our Christmas Fun page. Stay updated on the latest ideas by following us on Facebook, Pinterest, Instagram and Twitter.